The Russian opposition nominates its candidates for the September mayoral elections after the reports that the current Moscow mayor might resign. Following the claims made by some Russian media outlets that current Moscow mayor Sergei Sobyanin may quit soon, the Russian opposition puts forward prominent anti-corruption campaigner Alexei Navalny as a candidate for the new hypothetical mayoral race. The Opposition Coordination Council could nominate Alexei Navalny as a single candidate in early Moscow mayoral elections if such elections are held, former Russian State Duma deputy Gennady Gudkov told Interfax. 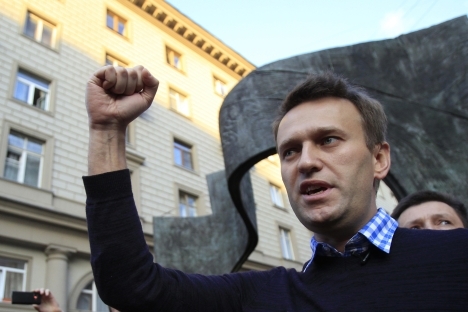 "The preliminary agreement to support A. Navalny as a candidate for Moscow mayor was reached at a meeting yesterday of the Coordination Council if the decision to hold them on September 8, 2013 is made," Gudkov said. Gudkov said that a number of influential members of the Opposition Coordination Council attended the meeting, including Boris Nemtsov, journalist Sergei Parkhomenko, State Duma deputy Dmitry Gudkov and others. Gennady Gudkov said that he did not aspire to become the mayor of Moscow. "I want to become the Moscow region governor and will participate in these elections, which will also take place on September 8, 2013. Neither me nor my son Dmitry will propose ourselves as candidates at the mayoral elections," he said. At the same time, Yabloko liberal party leader Sergei Mitrokhin has not ruled out that he could run for the post of Moscow mayor if early elections of the city's head are announced. Mitrokhin told Interfax that other candidates representing Yabloko had not been considered yet. "This issue was earlier discussed by the regional council of the Yabloko party's Moscow branch, and the regional council adopted a tentative decision to nominate me as its candidate. The regional council is expected to convene for a session once again on Thursday to discuss this matter. I do not rule out that I will run in Moscow's mayoral elections," he said. The Yabloko press service has reported that the party's founder Grigory Yavlinsky will support Mitrokhin's nomination for the post of Moscow mayor if the mayoral elections in the city take place on September 8. "Sergei Mitrokhin is an exceptionally worthy candidate for the Moscow mayor. He is an experienced politician, but, at the same time, he is an absolutely honest and humble person. He is a true Muscovite. Mitrokhin won the Moscow Duma elections more than once and has a considerable record of work in the Moscow economy and a ten-year career as a State Duma member. He also has a professional knowledge of Moscow's economic and social problems and is the author of laws on local government funding," Yavlinsky said. A source familiar with the situation told Interfax previously that elections of the Moscow mayor could be held earlier than planned, possibly on September 8, 2013. But the Moscow city legislature is required to set a date no later than 90 days ahead of the elections. Moscow Mayor Sergei Sobyanin has announce his resignation on Tuesday in order to be able to run in the city's mayoral elections in September. The story is based on materials from Interfax.